Playing the US government off against the British, Deripaska said he prefers the “great opportunity” in the US, “the cheapest cost of capital”, and an attitude towards him which is “very open”. Deripaska wasn’t referring to the recent opening in New York of his own secret financial records. The Sky reporter didn’t know to ask about them. 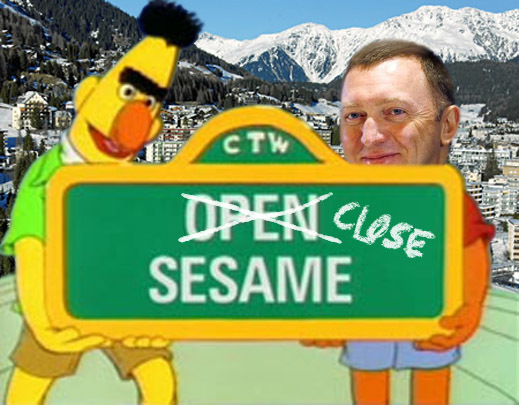 Deripaska’s collocutors in Davos ought to be better informed. The New York archive counts thousands of transactions over several years by companies of the Rusal group, its Jersey-listed stakeholder RTI Limited, haven-registered companies associated with Rusal or Deripaska personally, and Latvian banks through which the group moves cash out of Russia. Calibre Properties Worldwide Ltd., and Mont Cervin-Consultadoria E Servicos Unipessoal LDA are two associated companies named in the court papers on the Rusal side. The file, titled In re ex parte Application of Natica Shipping Ltd. is at the US Federal District Court for the Southern District of New York, case number 12-mc-00240-P1. This is the counter-claim to an earlier case filed in the same court on April 13, 2012, by the Rusal group, titled In re ex parte Application of RTI Limited to Take Discovery for Use in Actions Pending in the District Court of Nicosia, Cyprus, and Anticipated in the Court of Moscow, Russia, case number 12-mc-119-P1. The accumulation of secret data in the US has yet to reach the volume of the evidence collected in London and Israel by investigators for Mikhail Chernoy (Michael Cherney) in his UK High Court lawsuit for recovery of shares and money Deripaska had owed since 2001. That case was closed with a financial settlement in Cherney’s favour last September. But the lawyers arguing in court over the New York archive have been unable to agree on terms of confidentiality for the Rusal bank secrets, and the judges have yet to rule on whether the secrets should remain in the public domain, or be withdrawn. Accordingly, the evidence of Deripaska’s financial operations with Rusal products, cashflow, trade, and related-party purposes continues to accumulate ahead of the biggest of the shareholder actions currently running against Deripaska: this is Victor Vekselberg’s suit before the London Court of International Arbitration. In the meantime, however, the outcome of Rusal’s legal moves has been to expose in New York a treasure trove of secrets. The New York banks which have opened their files to divulge them include Deutsche Bank Trust Company Americas, JPMorgan Chase Bank, Citibank, Bank of New York Mellon, and Bank of America. Lawyers for Osipov and Natica claim Rusal’s campaign is motivated “in order to remove it as a competitor to the Rusal Group’s shipping activities.” In a cease-and-desist letter to Rusal last year, they charged that Rusal had violated chartering contracts; used unlawful surveillance and cyber-attacks on computers operated by the Osipov group; and fabricated documents to make unfounded allegations in the courts. In New York lawyers at Baker & Hostetler, acting for the Rusal group, claim “Natica and others are accused of fraud in Russia and Cyprus, therefore Natica’s discovery requests seeking sensitive financial information which is irrelevant to their claims are unduly intrusive.” Natica counters that the fraud claims are trumped up. More evidence and paperwork will postpone judgement by the US court, and thus keep the lid open on the Rusal transaction records for months still.